Three key words that represent our philosophy of ministry are love, acceptance, and forgiveness. God has shown us these by sending his son Jesus, and we should also display these attitudes to the world around us. It is by God’s grace that we are saved, not by works, so KBF has an open door policy that welcomes everyone to come and learn about Jesus. Jesus taught that it was impossible to store new wine in old wineskins, as the new wine would force the old skin to stretch too far, causing it to break. We understand that this need for new wineskins in our generation can be demonstrated by a biblical understanding of how to operate a church. Rather than the pastor being above all, he should be the example of serving. Instead of old programs that have lost their meaning, new ways of reaching people’s lives need to be established. Our worship style is casual and contemporary, with modern music and a seeker sensitive environment. Since Japan is quickly becoming an international society, our messages are bilingual, in Japanese and English. 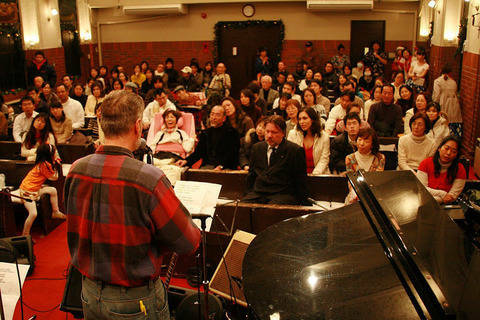 The stated goal of KBF is to reach the Kansai area by planting many new wineskin style churches. We believe that the gospel of Jesus Christ is the answer to people’s problems and if we can establish places of worship that exalt Jesus in a warm, welcoming environment, then many will believe and become Christians. Whether you are a Christian or not, we invite you to join us and experience the love of the Lord.